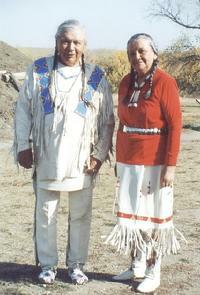 Regina Schanandore, known as 'Eagle Plume Woman, and her brother Carl Whitman, chairman of the Three Affliated Tribes, circa 1950. My family, the Schanandores, moved to Mandan, North Dakota in 1951. I can recall how my mother, Regina Schanandore, a well-known and respected woman of Mandan Indian descent, was always concerned about Crying Hill and the encroachment of homes being built closer and closer to that vicinity. It was with oral tradition that my mother and Indian elders knew that the site was sacred to them, and it was an aspect of the past that you won’t necessarily find in a history book. The pioneers who built the town of Mandan knew of the existence of Crying Hill and they called it as such. When the controversy arose regarding the extensiveness of economic development creeping towards Crying Hill, concerned residents approached my family and expressed their knowledge of what they had been told orally by their grandparents and others of the past generations about the Hill. Again, this is oral tradition from even the people of Mandan who are not of Indian descent. They too were concerned and respected the sacredness of the area and did not want to see its obliteration. Because of the numerous Indian villages that existed along the Missouri River, we can assume there were many such sacred hills, but today we do not know where they are located. However, with Crying Hill in Mandan, we literally know of its existence and can revisit and memorialize the site. I am pleased and grateful to you for your generosity in making the effort to preserve it. Hopefully, in the end my mother’s concern about Crying Hill will be, metaphorically speaking, laid to rest. I read about the Crying Hill Project and I believe it would be wonderful if the Mandan Nation could be honored through this project. I understand there is some controversy around the stories that we were told about the Hill; about how the Families of Warriors would climb Crying Hill and look for Mandan Warriors returning from battle. One of the reasons the Hill was not used in this way is because our People did not war. The Mandan men most certainly warred – but not with the Euro-Americans. We warred with the Sioux (as they were called by the government in those days) and our men also had to protect the villages we lived in from other Nations. In fact, some of the warriors from the MHA (Mandan, Hidatsa, Arikara) Nations served as scouts for Custer during that last battle. Our men have always been warriors and continue to this day as they continue to be overrepresented in our military when compared to all races. As for having no records, oral history was a very important method used to pass down through the generations the ways of doing things, including grieving, as Crying Hill became known for. There are many ways to recognize a loved one from a distance without being able to see his face. The horse he rode, the manner in which he rode, and the general appearance of the horse and the man together would have been sufficient to identify him, especially if you were on a hill and looking down at the men riding in. I see no dissonance here. In order to define how we were, it is important to know the culture – and unless you have a framework that begins with the first teachings of the child – it would be more than difficult to try to define what we did and to what purpose we did those things. I believe that Creator allowed the evolution of many cultures for the same reasons we have so many types of flowers – there are differences, but the combined beauty is incredible. We have the right to our own histories, even if the documentation is not enough for anthropologists. That which has been passed down orally from each generation of family sufficed for many centuries. Even if anthropologists can’t find any “proof” Crying Hill was used as I heard it from my beloved aunt, Regina Schanandore, it does not mean it did not happen as she described. The differences are due to culture. It reminds me of a famous court battle about a logging road that had not been completed. A Northern California Nation was opposing it because it disturbed their most sacred site where they did ceremonies. The court ruled against the Natives because they had built nothing to indicate this was a sacred site – as if something Man built could be more sacred than what God created. Thank you for taking the time to read this. As I stated previously, I believe Crying Hill deserves to be saved – economics aside. Sometimes it is just not about the money. This is an attempt to convince you who are making the decisions about “Crying Hill” to preserve this sacred site. My concern comes from the history of the Hill, which is part of my history. My bloodline flows back there and beyond. I am an enrolled member of the Three Affiliated Tribes. Mandan, or “Nueta”, is the tribe that I am enrolled under. A place of prayer is a sacred place to any group of people worshipping. It would be fitting to treat Crying Hill with respect and reverence, just as any other church grounds would be treated. Because today’s society is much more aware and much more respectful of other cultures, I would expect Crying Hill to be preserved so that we can all share in the presence that it holds. Through the preservation, future generations will also be able to see and experience the past. After all, Lewis and Clark and Sakakawea were instrumental in our way of life, and we celebrate them today. 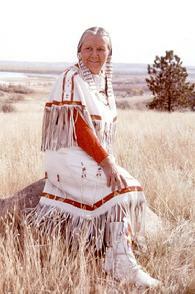 At one time, Mandan and Bismarck were a thriving Mandan, “Nueta”, community. So much of our historical sites have been lost and destroyed due to development and construction. I plead with you to prevent this from happening once again. After all, there is a saying that we must know our history to build a better future. Having lived in this area all of my life, I grew up knowing about a local hill that we all called Mandan Hill. Nevertheless, the only real connection I had with it during all these years was just reading the words MANDAN every time I drove by - first on the highway, then on the interstate. The majesty of this regional landmark gave me the wonderful familiar feeling of being only a few miles from home. Within the last few months, however, I have become aware that Mandan Hill is also called Crying Hill. In fact, it has been known as Crying Hill for hundreds of years. It is not just a hill with a word on it. It is a hill with rich history and a beautiful heritage. It is a hill with a profound meaning and a sincere message to those willing to listen. I have recently been spending a lot of time at Crying Hill, and have had the opportunity to meet and visit with people who have had a personal or family connection to that majestic part of God’s land. I now see it through different eyes. Crying Hill is a place that we need to preserve for so many reasons. We can enjoy learning about the hill’s cultural heritage, or simply sit at the top and listen to nature. I’ve seen an eagle flying overhead, and heard the wind whispering through the tall grass below me. The sun has set as I’ve looked out over the Missouri River valley. The experience is personal to each person who visits there… this is just one of the many wonderful things about Crying Hill. I grew up in Mandan and although I didn't know a lot of history about the hill, when I was younger, I had a family memory of my own. My dad was the one who put in the MANDAN sign on the side. I remember being up there when I was around 8 years old and looking at the view. I remember baking a cake for my dad and his workers and delivering it to him on the side of the hill. It has always been something I can show my kids when we go back. I am very proud of what he did and I thank you for preserving that location. It really would have been a shame to develop that land. Thank you for your interest in preserving our city's past and letting our kids experience a place of peace. �Being prehistoric means belonging to a period prior to that of recorded history. Well, all of the tribes in N.D. have already been documented and recorded by anthropologists, explorers, artists, fur traders, missionaries, doctors, and soldiers. According to that evidence we are not prehistoric so please quite digging up our Indian bones. They had 75 years to study the ones in the Heritage Center. When we were allowed in the storage rooms, I could not control my tears when I read �Crying Hill, Mandan, ND� on some boxes. That hill is a sacred burial place for my tribe of Mandans. It should be fenced off in memory and respect for this tough but gentle tribe whose doors were always open to anyone passing through this area who needed shelter from the elements, food, or clothes. I've talked with several of our people from Newtown, ND and they are very thankful to you. One particular old Indian woman, as I told her about the interest you had and Crying Hill, she got very teary eyed, put her head down, then looked at me, held my hand and said, 'Waste' which means....'Good'. She was at a loss for words; she was very happy that this site had a chance of being saved. My sister sent to me the information on Crying Hill via the web site www.cryinghill.com and BismarckTribune article. I was born and raised in the state of North Dakota. I lived in Mandan for 21 years and 13 years of those years I lived right below Mandan Hill on 13th Avenue. My 4 children love the memories of sledding down that hill during the Winter months. My husband, who grew up in Mandan, also has his stories and memories of - the hill. I am writing to you, first of all, to thank you for taking the initiative and time to preserve this great part of history in Mandan. It is a very important, but often neglected, part of the Native American history which Mandan should embrace as it's namesake. Thank you for preserving Crying Hill and it's history for the future of our people. I was born in Mandan. My parents bought a house on the hill in 1979 and we sold the place in 2000-2001. I wish we hadn't since it was the most interesting place in the world for me. I understood that land and still understand this land! I'm sure some people think I'm the craziest person in town. I have had numerous spiritual experiences up on the hill, had high school parties there, and grazed the land like my own herd seeking something I can't explain. Now that I'm older I've started to recognize this. It helped me become the person that I am. The Hill saved my life. How? I dont know. I can't explain it. I just believe it! Please preseve this land for it is one of Mandan's last oasises. On visits to Bismarck, I make it a point on returning to stop at Custer Park to visit the grand eagle sculpture there. I have been giving a lot of thought to where it could be better displayed, so as to be seen far and wide. What a great place for this majestic bird.